preserving rare and endagered web species! This page promptly delivers copies of abandoned websites which I consider valuable. Most of them originally are/were placed on freeware webhosting, such as fortunecity, and who knows how long those resources will keep dead sites up. In my workshop they find a quiet harbor to spend their retirement and perhaps discover a new life. The collection, however, is not limited to abandoned websites only - I also copy sites which I like or which are just fun to copy. I have always been fascinated by the idea of recreating someone else's world in the world of my own. Also, a copy might say a lot about the original. Taken out of context, a copy of a site might look like a museum exhibit, providing a very fresh look and a different, perhaps more historical perspective. Although I try to preserve sites in their original form, I do make changes, such as remove advertisement scripts, which usually take up to 60% of page code on those free hosting services, and fix broken links where it is appropriate. Some links are left dead for historical purposes. Apart from working copies, I am also including zip archives, so you can set up these sites on your site if you want. Archives contain corrected versions only. 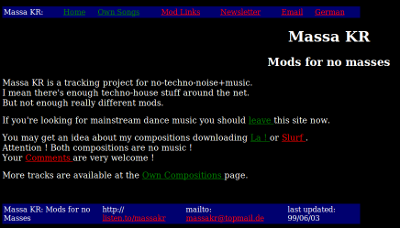 A very underground site, displaying tunes of Massa KR, a tracker musician who made noise music out of lo-fi samples. The site has been dead since 2000, while all released material dates back to 1998-1999. The site, however, can be an inspiration to some and also contains historically interesting links section, not to mention the great oldskool design. 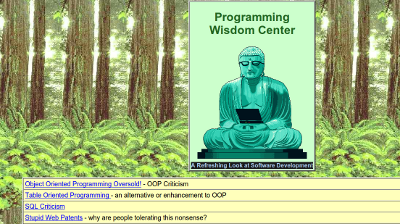 A unique site, notoriously famous for occasionally firing up debates on the topic of OOP. Thorough analysis not only of OOP, but of software development in general, as well as related fields, makes this a very interesting and even valuable resource. All articles are written by B. Jacobs. Previously hosted at geocities, after the closure of the service the site was luckily archived by reocities and now a clean copy has landed here. This is one weird site. A mix of dictionary, quote reference and encyclopedia, fUSION Anomaly has been around since August 1997. Many people might have stumbled upon this at some time of their Internet lives, but probably thought it to be too confusing to explore. As of 23.08.2010 fUSION Anomaly does not seem abandoned, although copyleft notice has not been updated since 2009. It is being created by one person, so its rate of growth is relatively slow anyway. I decided to copy this site for aesthetic reasons. I find the project to be very special and interesting to dive into. A functional resource on the surface, it gives an impression of a work of art. 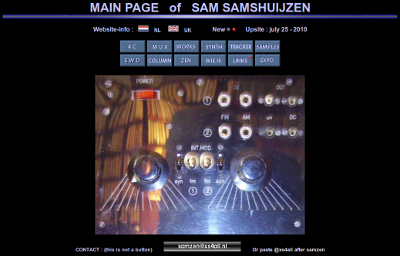 This is a site of a great musician, Sam Samshuijzen. He was an important and very much loved member of Modplug Central. This site is preserved in his memory. A great site to archive. 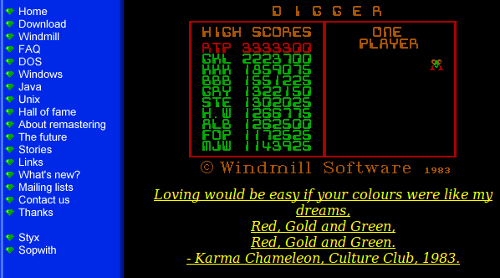 Digger is a 1983 PC game, which was hugely popular. It's clever scoring system, addictive gameplay and great design captivate gamers even today. In 1998, Andrew Jenner created a Free Software version of the game called Digger Remastered, by reverse engineering the original game. It is available for AmigaOS, DOS, GNU/Linux, GP2X, Java, Mac OS X, MorphOS, RiscOS, Sega Dreamcast, Unix and Windows.